Emily J. Hara The Squeeze truck. When Karliin Brooks turned vegan at the age of 16, she craved more than just granola bars. She went on to graduate from N.Y.U. 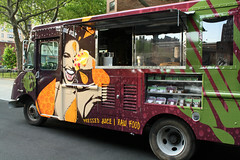 with a degree in Nutrition and Broadcast Journalism and then attended the The Natural Gourmet Institute. Now the 38-year-old caterer has reconditioned a onetime UPS truck and will use it to serve buckwheat popcorn and “Twix” bars made with dates and soybean in lieu of caramel. The East Village lost a raw food store when Jubb’s Longevity shuttered in 2008; more recently, it lost a vegetarian spot when Counter closed. Now, two doors down from the former Jubb’s, another raw food spot (this one a Los Angeles transplant) has opened its doors. 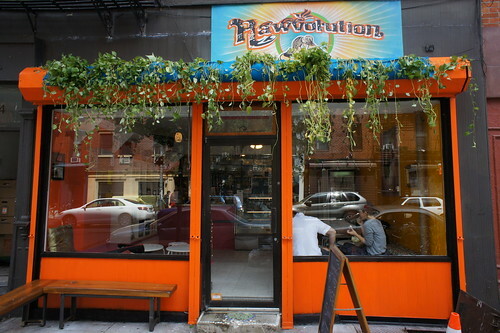 Euphoria Loves Rawvolution soft opened at 504 East 12th Street last Thursday. Its grand opening is today, and in two weeks it will begin offering a weekly cleanse that can be supplemented with “emotional shamanic journeys” and colonics.